As we continued our foray into scatter plots with Math 8, I pulled out an awesome and timely activity from Yummy Math. The students were given the opening weekend gross earning of 15 movies along with the lifetime theater earnings of those movies. The students created a scatter and analyzed the data to determine if the opening weekend was a predictor of future income. 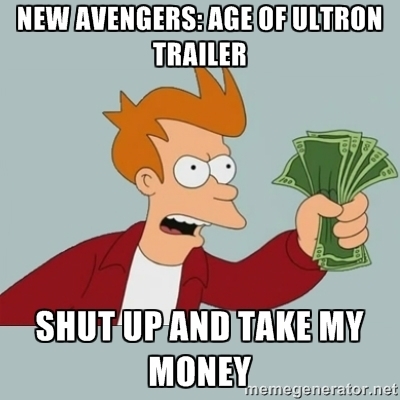 The ultimate goal was to, using the opening weekend gross, predict the future earnings of Avengers 2: Age of Ultron. We had a good conversation about toys and clothes that they were SUPER excited to get, but quickly lost their novelty versus ones that stayed fun or cool for years. The discussion was excellent and they put forth several idea about where certain movies would fall. Then they got started on the activity. A large percentage of the students seemed to have forgotten how to graph. It may have been because of the scale of the numbers but there was terrible confusion. When I did the lesson the second time with 8th period, I spent more effort examining the scale and how to graph specific points. The second group did much better with it and, interestingly, were MUCH more interested in talking about the Marvel Cinematic Universe. I should develop an entirely comic book-based math course. "How much does Mjolnir weigh?" "What would happen if Superman punched you as hard as he could?" "Could Superman fly against the rotation of the Earth and turn back time?" You know, the important questions! Most of these can be found online in the form of videos or article from smart nerds, but it would be pretty amazing to turn them into a course the covered robust and interesting mathematical concepts. We touched a bit upon this in geometry today when, in talking about tangent lines, I got to discuss roller coasters, the Gravitron and using a stop watch to determine the radius of the Earth. The majority of the class was enthralled and it reminded me that I've been doing things wrong. This is the kind of stuff that should be the norm in my class, not the exception. Well, I'm not quitting teaching yet, so there's still time to get better! I am often asked if there are some business helpful moments in the movies. Having read your article, I would say yes they are. I think virtual data room free trial services idea is from the movies.